The African Elephant is an iconic African Mammal, the largest land mammal in Africa and indeed the world. It captivates and evokes emotion. 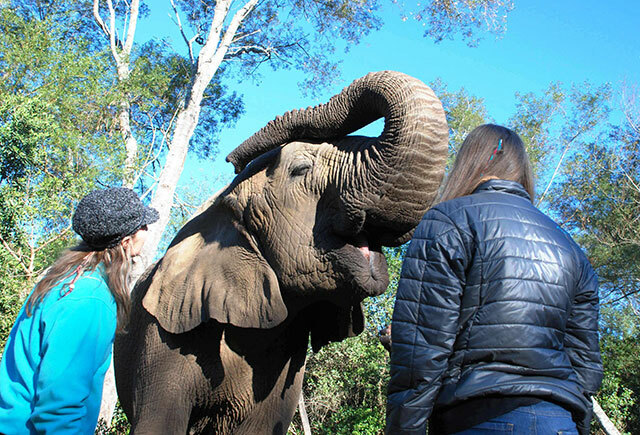 If you want an up-front and close ‘living’ encounter with our resident Elephants, then this Eco-Volunteer program is for you. This 2-week African Elephant “BIG FOOT” Living Eco-Learning Volunteer Awareness Experience is a participative Elephant focused Eco-Learning program and comprises learning and participating in a residential, structured and dedicated Elephant specific eco-volunteering program, utilising innovative approaches to deciphering observable elephant behaviour and applying sound operational animal management care, husbandry and welfare strategies, procedures and protocols in a quassi captive environment. This interactive program is managed on an Outcome based manner where all participants take away invaluable knowledge and experience which can be measured, quantified and qualified through the acquisition of new and innovative life skills and personalized perceptions and skills. 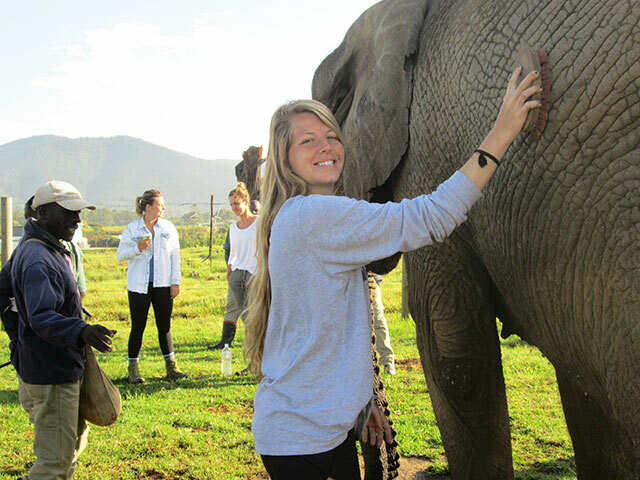 You the Eco-volunteer will reluctantly leave the program enriched with Elephant ‘sense’, Elephant life and Elephant memories which are unsurpassed and friendships forged into the future. This program is designed for a minimum stay of 2-weeks to fully understand and get immersed in Elephant Talk, Elephant Walk and our resident Elephants Lives. The program is fun, exciting and memorable in every regard. Join us on an Elephant Adventure. 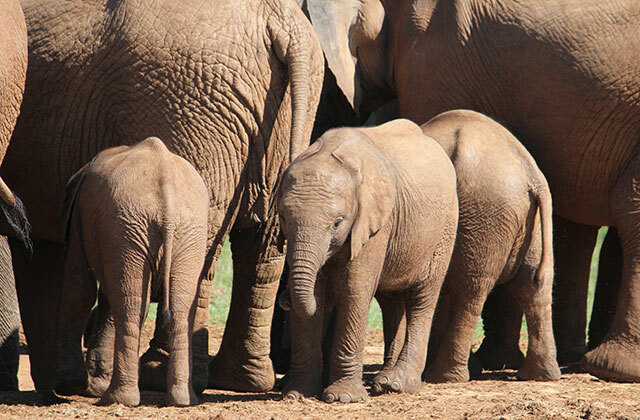 Elephant Husbandry, Care, Welfare and Management (Animal & Facility) Interactive Module. Eco-Learning Volunteers will be led through the various facets of Elephant Husbandry, Care, Animal Welfare and Animal Management principles and protocols by a hands-on facilitator/instructor who will guide the experience and the learning outcomes in a fun and entertaining manner. You will get down and dirty with every facet of an Elephants life in a qaussi captive environment. You will become involve in the various physical Facility Management functions on a day-to-day basis inclusive of repairs and maintenance and general operational requirements through your day. You will be required at close of day to report back on your experience and provide feedback to your participating peers as to what you have experienced for the day. Each day you will be tasked with individual and group research assignments. Animal Management Principles, Procedures, Operations and Protocols – You will be exposed daily to the Care, Husbandry and Welfare of the resident Elephants. This includes feeding tasks, cleaning stalls, loading waste, monitoring, water management, etc. Research Initiatives – You will be involved in daily recording of Feed Utilisation Analysis and Dung Analysis. Facility Management – You will be exposed to the daily operations of the Elephant Sanctuary and will be asked to do repairs and maintenance around the sanctuary, assist with the guest interactive component of the business, and general assistance where required. You will be exposed to the guest interactive experience. Elephant Knowledge – Getting to Know your Subjects. You will be introduced to each elephant through Eley-Identi-Kits, Anatomy and Physiology of Elephants, Anatomical adaptations, Ancestry, Elephant Postures and Locomotion; and Elephants in Culture. Much of what you experienced and learnt during the first module will be carried over to this module with continued application practically daily of what was learnt. Eco-Volunteer learners are guided through the use of various tools, techniques and mechanisms to record, monitor and note interesting behavioural observations and features pertaining to each of the Elephants on a daily basis in a fun and informative way. In addition to these 2- Weeks segments, you will be exposed to localised Conservation Projects and Research initiatives. Conservation Projects – Conservation projects in the region include clearing of Invasive and Alien plant species; Monitoring Estuarine Ecosystems; Clearing Hiking paths and trails; Beach debris clean ups and documenting debris found; to name but a few. Please note that you will be exposed to 2 of these Conservation projects during your stay with us. Conservation Research Initiatives – These initiatives include Bird Ringing; Fish monitoring; Fynbos Research initiatives; Bird monitoring; Marine Animal research initiatives, Reptile & Snake Handling initiatives; Macro Invertebrate Research; and Seabird Research, to name but a few. Please note that you will be exposed to 2 of these research initiatives during your stay with us. On the final Friday evening we will do a complete debriefing regarding your experience and present Certificates and Special awards to Eco-Volunteers. This evening we will have an organised dinner function. Saturday is used for packing and onward journeys. Each component of the program gives you the opportunity to experience the Elephant Sanctuary and interact with our resident Elephants in close quarters daily. 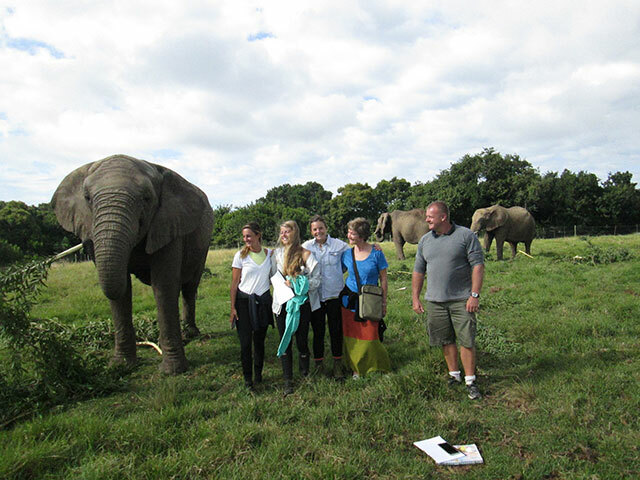 If it is a learning experience you seek and an African Elephant Adventure like no other then this program is for you. These programs commence on the 1ST MONDAY of the stipulated and scheduled month subject to availability. This includes an Enrolment form, Kit List for the duration of the Program, an Indemnity Form (Completed, Signed and Returned with the Enrolment form), Medical Release & Dietary Preference Form and the Payment Options Available to Prospective Eco-Learners. All participants should be aware of our operating terms and conditions as highlighted in the PLANNING YOUR TRIP document. A Program of Optional Activities in the region is provided as part of your Enrolment Pack. This list of activities will assist you in deciding what activities or adventures you would like to partake in on your weekends. Please note that these activities DO NOT form part of the Eco-Volunteer Awareness program you are registered for. These OPTIONAL activities are for your OWN ACCOUNT and in your off-time. Bookings can be done through your facilitator and transport can be arranged and priced specific to where the activity offered. In most instances facilitators will assist with transport and accompany you. 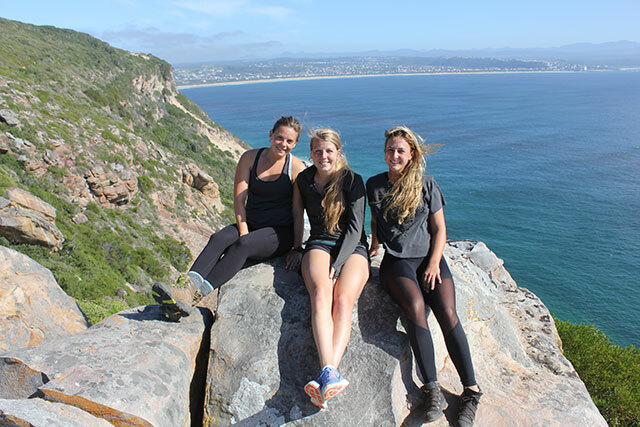 This 4-week Africa’s “Dwindling Giants” Elephant Management and Behaviour Eco-Learning Volunteer Experience is an informative, fun yet formalised Elephant focused educational program and comprises learning through Wildlife Eco-Volunteering along the Garden Route of South Africa participating in a residential, structured and dedicated Elephant specific volunteering program which is founded on outcome-based learning objectives with innovative approaches to deciphering observable elephant behaviour and applying sound operational animal management care, husbandry and welfare strategies, procedures and protocols. Each program is structured and organised with developmental interactive learning from day to day. This interactive program is managed in such a manner where all participants take away invaluable knowledge and experience which can be measured, quantified and qualified through the acquisition of new and innovative knowledge and acquired interpretive skills. 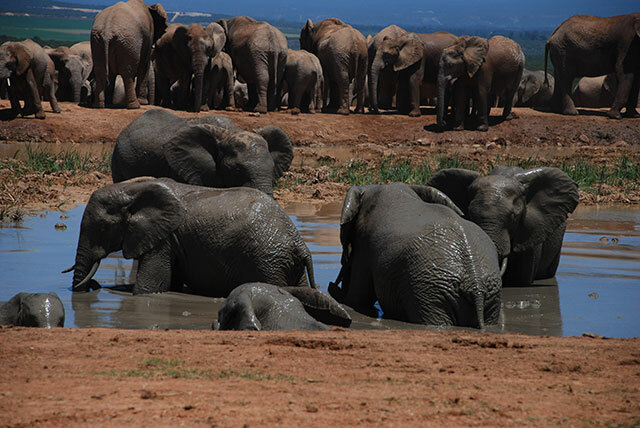 This program gives an insight into both the quassi captive and the wild roaming populations of African Elephants and the way that they have adapted to change and sound wildlife management strategies and initiatives. You the Eco-volunteer will reluctantly leave the program enriched with Elephant ‘sense’, Elephant life and Elephant memories which are unsurpassed and friendships forged into the future. Eco-Volunteer learners will be led through the various facets of Elephant Husbandry, Care, Animal Welfare and Animal Management principles and protocols by a hands-on facilitator/instructor who will guide the experience and the learning outcomes in a fun and entertaining manner. You will get down and dirty with every facet of an Elephants life in a qaussi captive environment. You will become involve in the various physical Facility Management functions on a day-to-day basis inclusive of repairs and maintenance and general operational requirements through your day. You will be required at close of day to report back on your experience and provide feedback to your participating peers as to what you have experienced for the day. Each day you will be tasked with individual and group research assignments. Elephant Knowledge – Getting to Know your Subjects. You will be introduced to each elephant through Eley-Identi-Kits, Basic Anatomy and Physiology of Elephants, Anatomical adaptations, Ancestry, and Elephant Postures and Locomotion. Much of what you experienced and learnt during the first module will be carried over to this module with continued application practically of what was learnt. Eco-Volunteer learners are guided through the use of various tools, techniques and mechanisms to record, monitor and note interesting behavioural observations and features pertaining to each of the Elephants on a daily basis in a fun and informative way. We use three key principles in behavioural monitoring – Observation, Interpretation and Deduction. 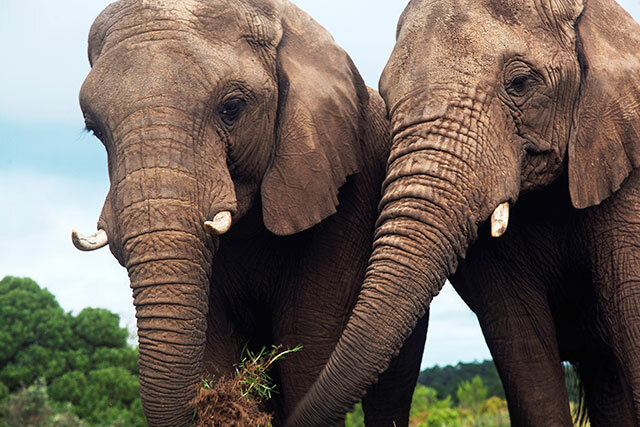 Eco-Volunteers will be taken to Addo Elephant National Park near Port Elizabeth for a 5-Day Elephant Observation, Interpretive and Facilitated SAFARI experience where Wild Elephant Behavior is observed, monitored and accounted for on a daily basis. During this phase we will look at the effects Elephants have on the greater ecology of an area with many interesting facts being communicated as we journey through the park on a daily basis. During our stay we will also observe all the other representative animals in Addo and how they related to one another with their unique niche habitats and survival success opportunities in African Safari Style presented in a fun and informative manner. We depart for Addo National Park on the Monday morning and return late Friday afternoon of the same week back to the Elephant Sanctuary. Wild Roaming Population Dynamics – Each morning and afternoon you the Eco-volunteer will be taken on a guided interpretive Elephant safari where all the behaviours that have been observed and noted can now be applied to wild roaming animals. We use the powers of observation, interpretation of that observable behaviour and make deductions and draw conclusions as to behavioural outcomes. During these daily outings we will encounter other species and discuss ecosystem dynamics and the natural balances. 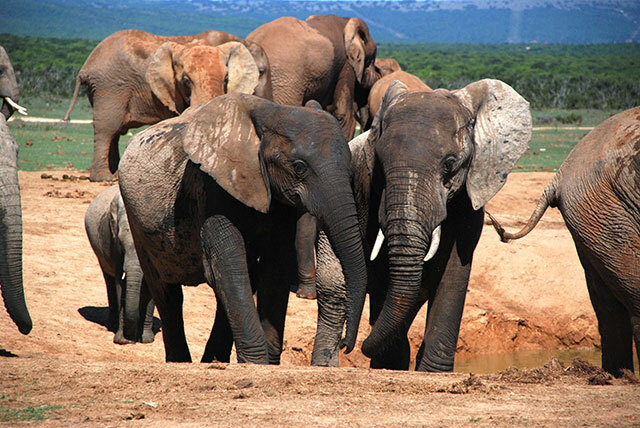 This component of the program will be presented in Addo Elephant National Park. 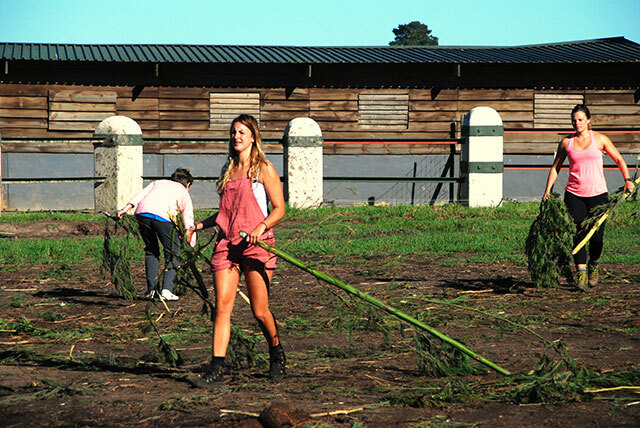 Eco-Volunteers are once again back at the Elephant Sanctuary with day-to-day chores relating to the elephants being addressed as well as additional group tasks being undertaken where all observations found within wild and captive elephant populations, observed on our Elephant journey so far are brought together in a group project based outcome. Individual experiences and interesting facts pertaining to elephant life, ecology, behavior and adaptability are collated by the group in presentation format. Each day participants will be required to compile their own account of an elephants life in captivity and in the wild through photographic accounts, written accounts and recorded research data which not only is a living memory of your experience with the African Edu-Eco Wizard team at the Elephant Sanctuary but also a data contribution to the daily management. Other elephant encounters may be added to this dynamic account from time-to-time. In addition to this you will be exposed to a variety of localised Conservation Projects & Conservation Research Initiatives over the duration of your stay with us. This region, due to its diversity of habitat and endemic species accounts are a favoured research zone. Elephant Account – During this module we sum up the whole experience and collate all the information into a single document which will be reproduced as a conclusive account of your experience and taken away with you. 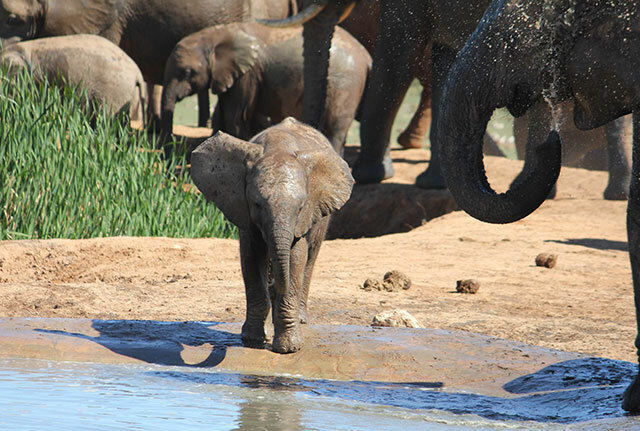 You and your group are the editors of your own individualised Experiential Elephant Encounter in Africa. On the final Thursday we will do a complete debriefing regarding your experience and present Certificates and Special awards to Eco-Volunteers. This evening we will have an organised dinner function. Friday is used for packing and onward journeys. 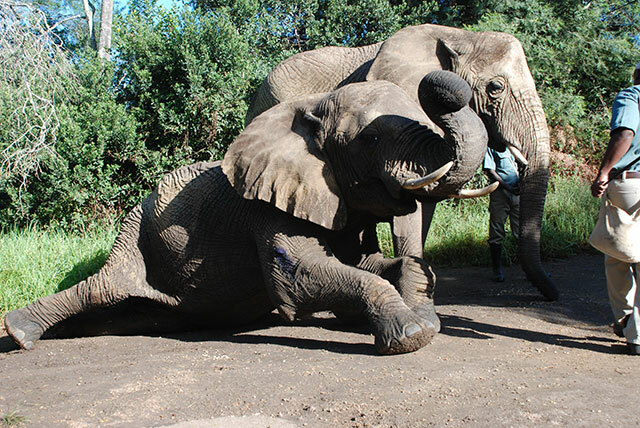 Each component of the program gives you the opportunity to experience the Elephant Sanctuary, Wild Elephants in Addo National Park and our resident Elephants in close quarters daily. In addition to this you will throughout the program be exposed to localised Conservation Projects and Research initiatives. The iconic status of the African Elephant being the largest land mammal in Africa and in the world has given rise to this awesome, fun, exciting and fulfilling 5-Day African Elephant Behavioural & Wildlife Awareness Eco-Learning Safari into Addo Elephant National Park, a national park dedicated to the preservation and conservation of the African Elephant in Africa today. This 5-Day Safari Program is a formalised Wild Elephant population focused educational program and comprises learning through a participative, structured and a dedicated Elephant specific Eco-Learning program which is founded on outcome-based learning objectives with innovative approaches to deciphering observable wild elephant behaviour in wild populations of elephants, interpreting that behaviour and analysing how they relate to their environment and other animals in the ecosystem and their ecological roles, functions, impacts and inter-relationships. 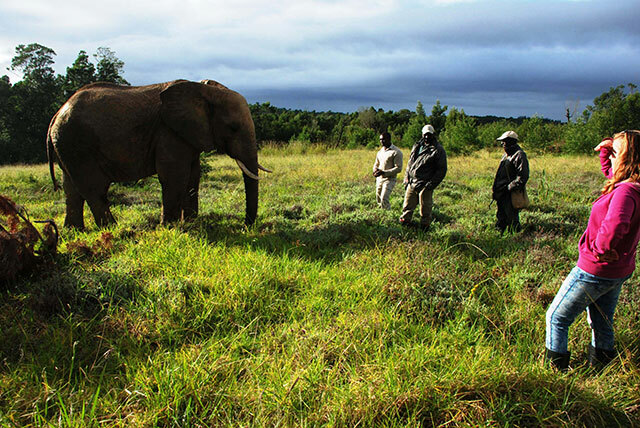 This Eco-Learning SAFARI program gives an insight into the wild roaming populations of African Elephants and the way that they have adapted to change and sound wildlife management strategies and initiatives in established Game Reserves and National Parks. You the Eco-volunteer will depart from the program enriched with Elephant ‘sense’, Elephant life and Elephant memories which are unsurpassed. 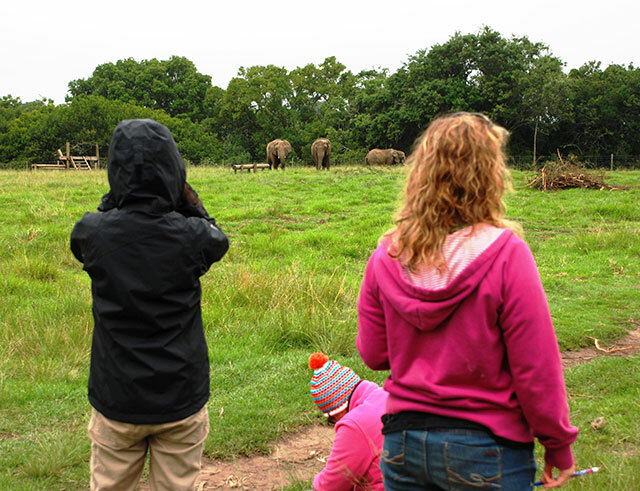 Eco-Volunteers will be taken to Addo Elephant National Park near Port Elizabeth for a 5-Day Elephant Observation, Interpretive and Facilitated SAFARI experience where Wild Elephant Behavior is observed, monitored and accounted for on a daily basis. During this phase we will look at the effects Elephants have on the greater ecology of an area with many interesting facts being communicated as we journey through the park on a daily basis. During our stay we will also observe all the other representative animals in Addo and how they related to one another with their unique niche habitats and survival success opportunities in African Safari Style presented in a fun and informative manner. 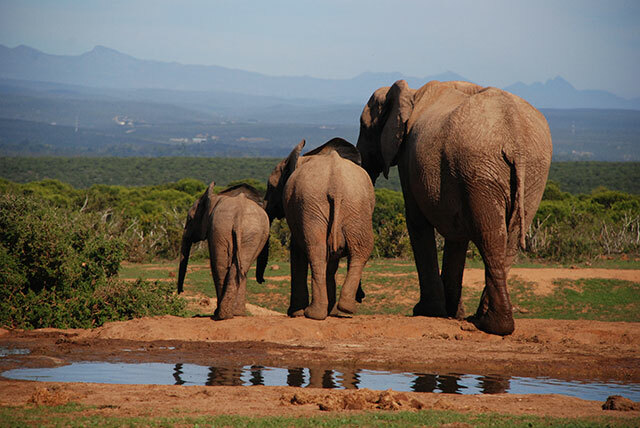 We depart for Addo National Park on scheduled dates on the Monday morning early and return late Friday afternoon of the same week back to the Elephant Sanctuary in Plettenberg Bay for onward journeys. 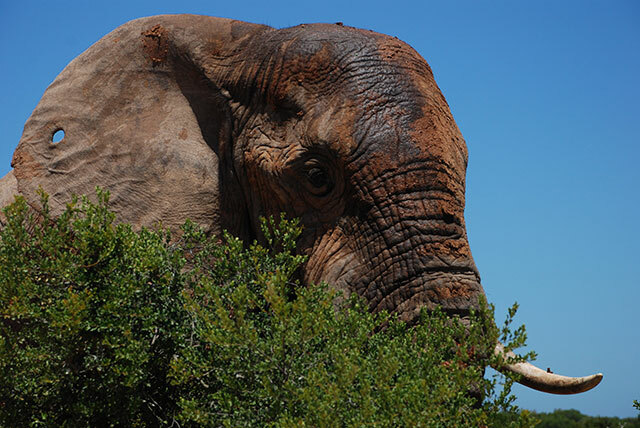 Wild Roaming Population Dynamics – Each morning and afternoon you the Eco-Learner will be taken on a guided interpretive Elephant safari where all the behaviours are observed and noted and how this can be applied to wild roaming animals. We use the powers of observation, interpretation of that observable behaviour and make deductions and draw conclusions as to behavioural outcomes. During these daily outings we will encounter other species and discuss ecosystem dynamics and the natural balances. During this module volunteers will be accommodated in traditional camping style – in shared dome-tented accommodation. From time to time rescheduling in the 5-Day schedule as outlined above may occur due to the programs dynamic nature.